DBT uses Emotion Regulation skills to help us change our emotions or situations. But sometimes it's not appropriate or we're not able to change the situation or our emotions, then we should use Distress Tolerance skills. Emotions are normal and everyone experiences them. Sometimes, particularly when we have had persistent distressing experiences during our lives, we can emotionally react more often to situations (that others may not find distressing) where we feel threatened. The distress can be very intense and it's difficult to manage ourselves and situations when things are feeling so over-whelming. Learning Emotion Regulation skills will help us learn to effectively manage and change the way we feel and cope with situations. 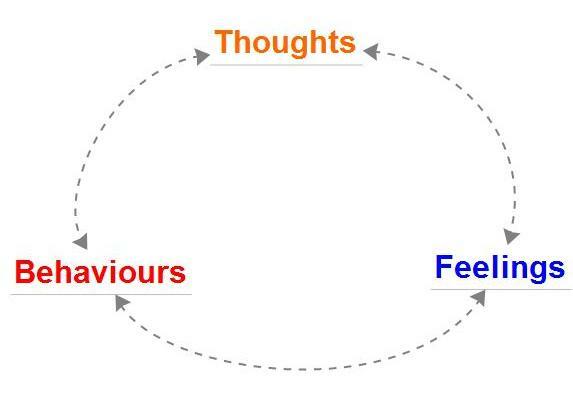 Emotions, thoughts and what we do or feel an urge to do (behaviours) are all linked and become vicious cycles. Changing one part of the cycle will help improve the situation and help you feel better. When we experience really strong negative emotions, it’s easy to get caught up into the old pattern of using unhelpful and damaging coping strategies such as using substances, self-harming or unhealthy eating habits. Emotions are closely linked to our bodies, and each emotion has a particular behaviour linked to it. The word "emotion" can be described as E - MOTION (Elicit Motion). The acronym PLEASE Master can remind us what we can do regularly in order to keep ourselves healthy and stable. It is about looking after our physical health which which enable us to better cope with mental distress. Do more enjoyable activities – every day (see the list of distractions for ideas). Do more enjoyable activities than you would normally do, schedule them in each day. As thoughts play such an important role in our distressing emotions, it can be very effective to notice these thoughts, and learn to think differently, or to think about thoughts in a different way. What am I REALLY reacting to? What is it that is really pushing my buttons here? What is it that I think is going to happen? What harm has actually been done? Am I overestimating the danger? Am I underestimating my ability to cope? What advice would I give someone else in this situation? How would someone else see this situation? What’s the bigger picture? What would be the consequences of responding the way I usually do? Sometimes we can get horribly distressing intrusive images that just pop into our heads, and we have trouble getting rid of them again. The image may be based on a real memory, or just some random terrible image. These images can trigger strong physical sensations, and intense emotions of fear, dread, anger or sadness. Imagine putting the image on a TV screen. Now with an imaginary remote control, make the image smaller, making it more distant, perhaps turn it into black and white, remove the sound or give it a different soundtrack. Imagine a plate or sheet of strong clear plastic and put it between your face and the image. Push that image away from your face, until it gets smaller and is further away.